December 18, 2012 - Pegasus Airlines, the second largest airline in Turkey, has signed for up to 100 A320neo Family aircraft (58 A320neo and 17 A321neo models), of which 75 are firm orders. 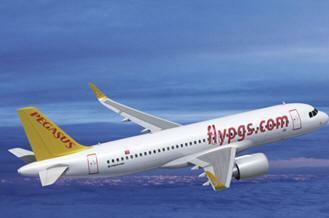 Pegasus becomes a new Airbus customer and the first Turkish airline to order the A320neo. Incorporating new engines and large "Sharklet" wing tip devices, the A320neo Family will deliver fuel savings of 15 percent. The reduction in fuel burn is equivalent to 1.4 million liters of fuel - the consumption of 1,000 mid size cars, saving 3,600 tons of C02 per aircraft per year. In addition, the A320neo Family will provide a double-digit reduction in NOx emissions and reduced engine noise.Airbus has received more than 8,800 aircraft orders and over 5,300 aircraft delivered to over 380 customers and operators worldwide.